Learnfast is a authorized testing center. We not only offer the certified courses in preparation for you to successfully prepare for your exams but we can also offer these exams at our facilities. 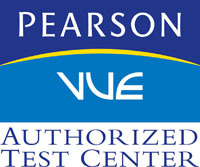 Learnfast is now Pearson Vue Authorized Test Center. Pearson VUE delivers over 4 million high-stakes exams a year for clients in the licensure, certification, academic admissions, regulatory and government testing service markets. We offer a wide variety of licensure/certification exams through Pearson Vue such as Microsoft, ACSM, Adobe, Cisco Systems, Inc., Citrix Systems, Inc., CompTIA Testing, Excelsior College, HIT Pro, International Code Council Certification, Linux Professional Institute Testing, Novell Testing and many more. Learnfast is Certiport Authorised Testing Centre and helped many application users to prove their knowledge by successful passing exams in comfortable and relaxed environment. Certiport is a trusted test delivery provider for many different applications and technologies, such as Microsoft, Adobe, Autodesk, CompTIA and many more.